« Historia: Politik och pubar i gamla England! Kampanj: Mannen bakom Donald Trumps valseger! VAL 2016 | Presidentvalet 2016 kommer att studeras för lång tid framöver. Och en av nyckelfigurerna i Trumps kampanjstab var Jared Kushner. Kushner är precis som Trump inom fastighetsbranschen. Och precis som Trump saknar han någon egentlig erfarenhet av politik innan han fick hand om valkampanjen. Detta hindrade honom dock inte från att sätta ihop en framgångsrik valkampanj på nästan inga resurser alls – åtminstone i jämförelse med Hillary Clintons välfyllda kampanjkassa. Steven Bertoni berättar om framgångsfaktorerna i en artikel för tidskriften Forbes. No resources at the beginning, perhaps. Underfunded throughout, for sure. But by running the Trump campaign–notably, its secret data operation–like a Silicon Valley startup, Kushner eventually tipped the states that swung the election. And he did so in manner that will change the way future elections will be won and lost. President Obama had unprecedented success in targeting, organizing and motivating voters. But a lot has changed in eight years. Specifically social media. Clinton did borrow from Obama’s playbook but also leaned on traditional media. The Trump campaign, meanwhile, delved into message tailoring, sentiment manipulation and machine learning. The traditional campaign is dead, another victim of the unfiltered democracy of the Web–and Kushner, more than anyone not named Donald Trump, killed it. It was the epitome of the super-light startup: to see how little they could spend and still get the results they wanted. Among those in his close circle, Kushner was the natural pick to create a modern campaign. Yes, like Trump he’s primarily a real estate guy, but he had invested more broadly, including in media (in 2006 he bought the New York Observer) and digital commerce (he helped launch Cadre, an online marketplace for big real estate deals). More important, he knew the right crowd: co-investors in Cadre include Thiel and Alibaba’s Jack Ma–and Kushner’s younger brother, Josh, a formidable venture capitalist who also cofounded the $2.7 billion insurance unicorn Oscar Health. At first Kushner dabbled, engaging in what amounted to a beta test using Trump merchandise. ”I called somebody who works for one of the technology companies that I work with, and I had them give me a tutorial on how to use Facebook micro-targeting,” Kushner says. Synched with Trump’s blunt, simple messaging, it worked. Kushner structured the operation with a focus on maximizing the return for every dollar spent. ”We played Moneyball, asking ourselves which states will get the best ROI for the electoral vote,” Kushner says. ”I asked, How can we get Trump’s message to that consumer for the least amount of cost?” FEC filings through mid-October indicate the Trump campaign spent roughly half as much as the Clinton campaign did. Just as Trump’s unorthodox style allowed him to win the Republican nomination while spending far less than his more traditional opponents, Kushner’s lack of political experience became an advantage. Unschooled in traditional campaigning, he was able to look at the business of politics the way so many Silicon Valley entrepreneurs have sized up other bloated industries. Television and online advertising? Small and smaller. Twitter and Facebook would fuel the campaign, as key tools for not only spreading Trump’s message but also targeting potential supporters, scraping massive amounts of constituent data and sensing shifts in sentiment in real time. This wasn’t a completely raw startup. Kushner’s crew was able to tap into the Republican National Committee’s data machine, and it hired targeting partners like Cambridge Analytica to map voter universes and identify which parts of the Trump platform mattered most: trade, immigration or change. Tools like Deep Root drove the scaled-back TV ad spending by identifying shows popular with specific voter blocks in specific regions–say, NCIS for anti-ObamaCare voters or The Walking Dead for people worried about immigration. Kushner built a custom geo-location tool that plotted the location density of about 20 voter types over a live Google Maps interface. For fundraising they turned to machine learning, installing digital marketing companies on a trading floor to make them compete for business. Ineffective ads were killed in minutes, while successful ones scaled. The campaign was sending more than 100,000 uniquely tweaked ads to targeted voters each day. In the end, the richest person ever elected president, whose fundraising effort was rightly ridiculed at the beginning of the year, raised more than $250 million in four months–mostly from small donors. 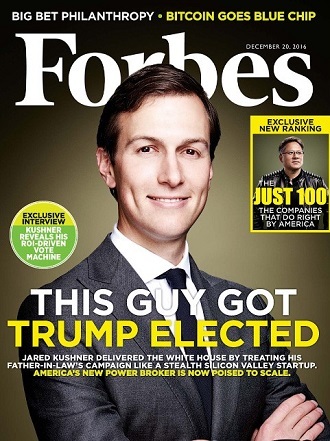 Läs också: ”Jared Kushner’s Trump Card” av Devin Leonard och ”Trump’s Data Team Saw a Different America—and They Were Right” av Joshua Green och Sasha Issenberg i Bloomberg Businessweek. Tidskriftsomslag: Forbes, 20 december 2016.